SKU: FFJumpBoots. Categories: Shop All ThinLine Products, Flexible Filly Horse Products, Hunter Jumper Tack, Horse And Rider Tack, Horse Boots. Tags: air bag horse boot, breathable horse boot, custom horse boot, flexible horse boot, jumper horse boot, jumping horse boot, light weight horse boot, lightweight horse boot, open front horse boot. 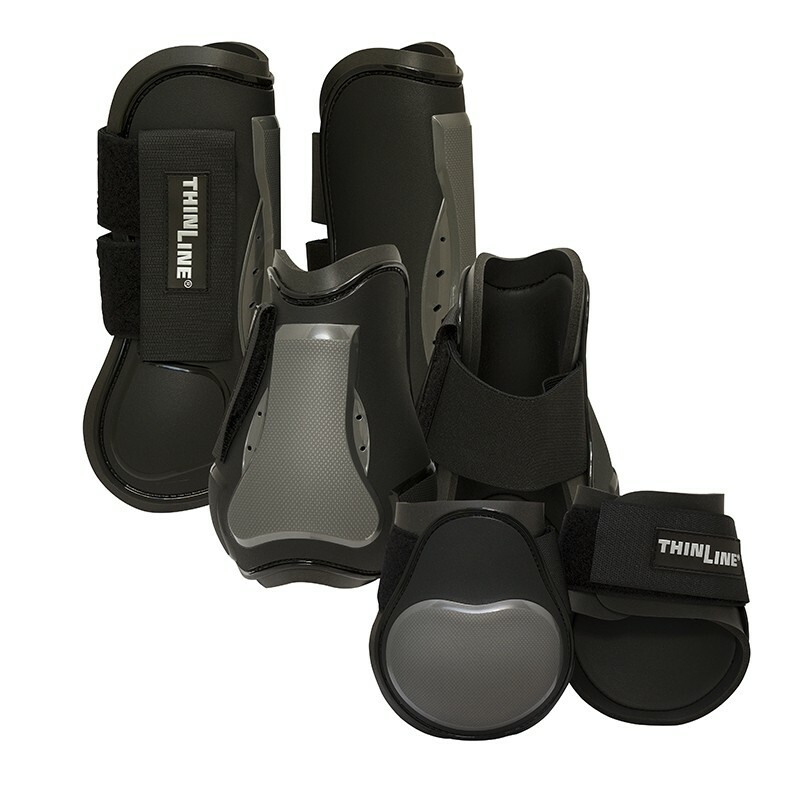 Wrap your horse in comfort with this lightweight breathable nonslip protective horse boot. These shock horse boots are great for horses and even better for owners. The low profile fit is only outdone by the ease of care for horse owners. Our trademark open cell technology delivers impact protection in a wafer-thin breathable foam, perfect for a shock horse boot. ThinLine doesn’t compress. Pressure points; created from tendons, bones, splints or wind puffs, are gently shaped into the ThinLine memory, which rebounds once it is off the horse. Also, an anti-microbial agent is infused into ThinLine, allowing use on multiple horses. 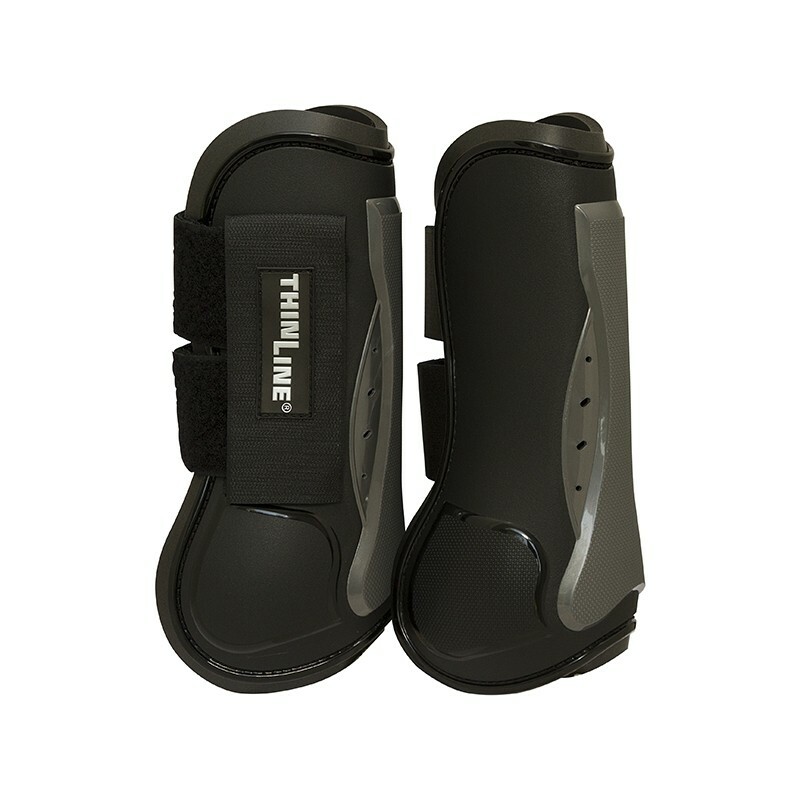 Finally, ThinLine foam does not absorb water or collect dirt, which means boots stay in place and are easy to maintain. The exterior of this boot is designed with Air Cushion Technology and Flexible Concussion Protection with an Offset Strike Guard. 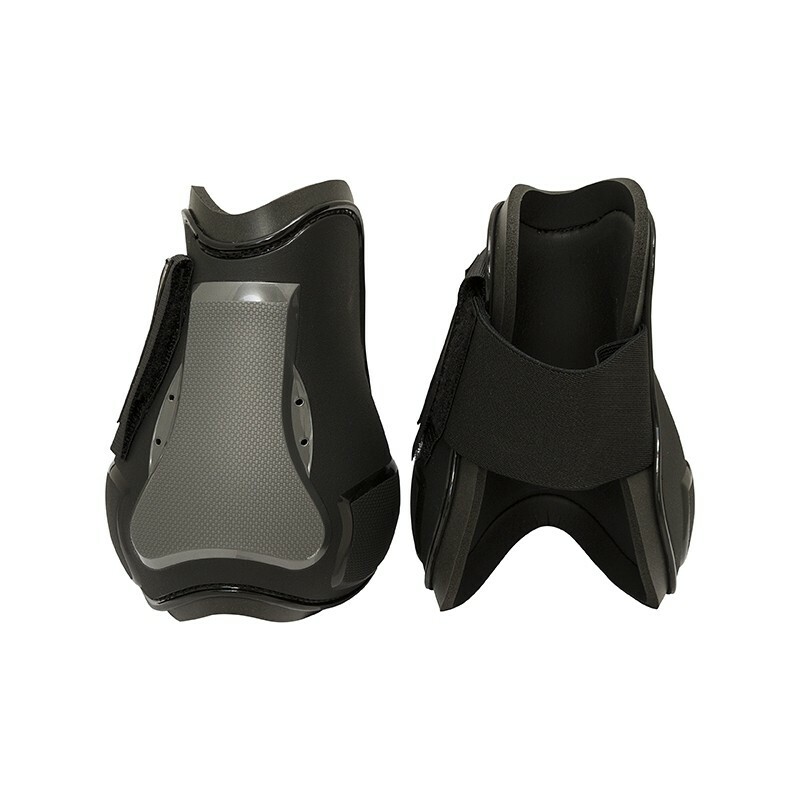 The Offset strike guard design is made of a stiff TPU material to spread out impact forces. The raised shape is designed to flex slightly during impact to help dampen and reduce impact force. Underneath the guard is an airbag insert running the length of the tendon. The airbag lies flat in the strike guard space between the inner foam lining and strike guard shell. Air cushions offer enhanced boot fit and comfort. They last the lifetime of the boot and will always remain flexible allowing for better tendon, ligament, and joint movement than other boots. The remainder of the shell is a flexible TPU. Our lightweight and breathable horse boots are designed to leave no desire unturned. The ThinLine warms to body temperature creating a custom fit. None of the materials absorb water, meaning boots won’t shift or rub. And it makes them easy to clean and quick to dry. Dirt does not stick to the ThinLine, keeping your horse free from irritations. 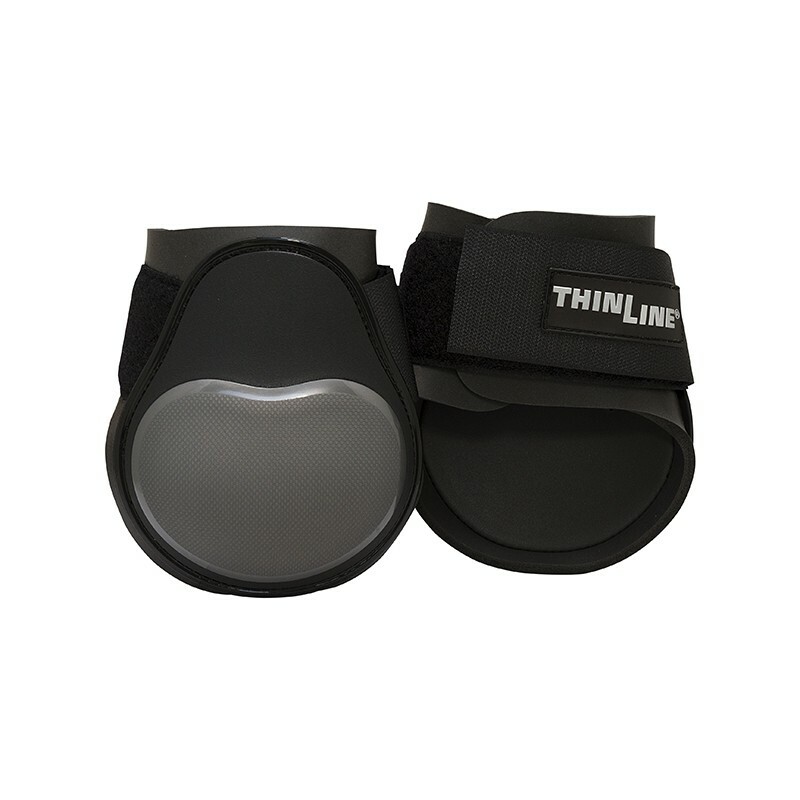 Additionally, ThinLine ventilates to keep tendons cool. 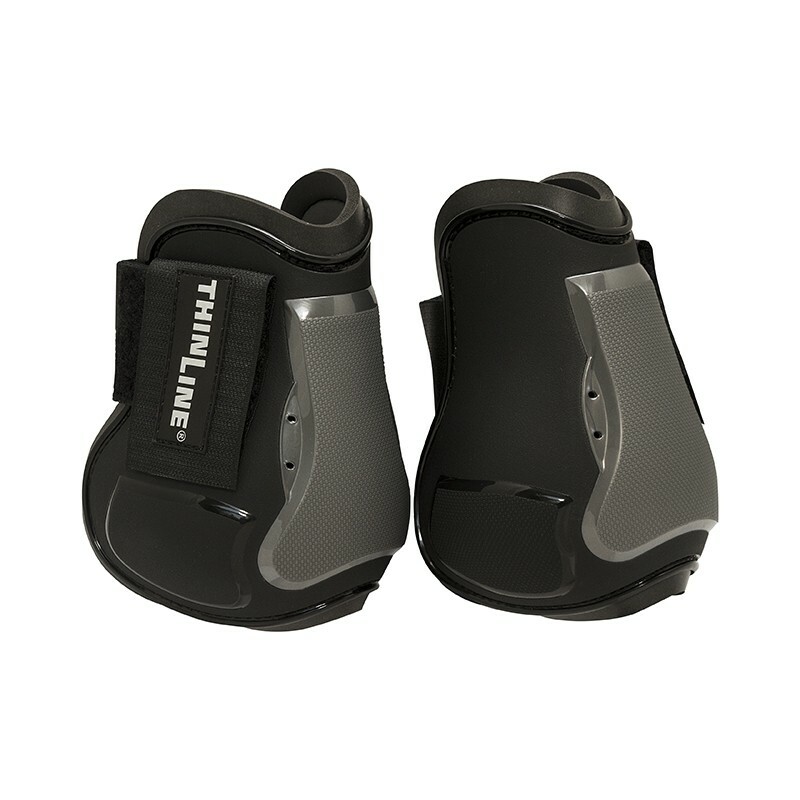 As always, ThinLine is the most durable material in the equestrian world, allowing riders to get more performance from their horse boots. in Black with Silver. Due to its flexibility, one size fits most horses. Scroll down to see sizing charts. Sold in pairs, one for the left, one for the right. Super Durable. Puppy not included. 30 day Money Back Guarantee. One year product warranty. Front Boots: 9.5″, 24.13cm tall, circumference 10.5″, 26.67cm. 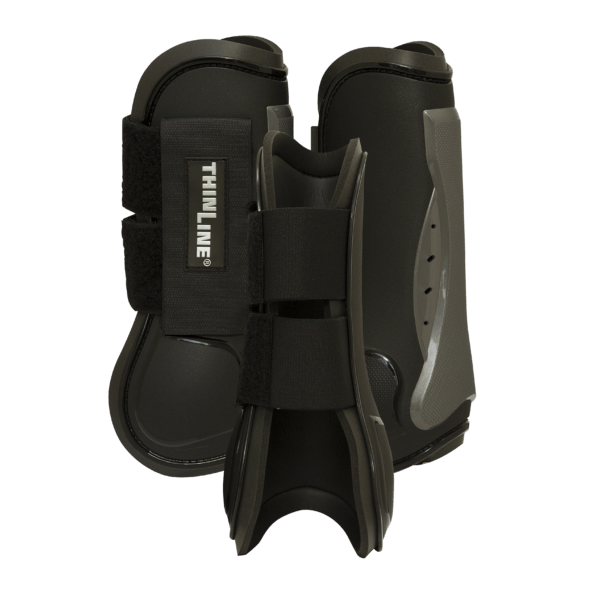 Fetlock Boots: 6.24″ tall, 15.88 cm. circumference 11.5″. 29.21cm. The ThinLine material will mold to the horse’s leg, creating a custom fit. What we love most about this boot! Simply hose off and they are like new again. Feel free to use dish soap.